El Presidente gained prominence among Prohibition-era travelers to Cuba, notably at Havana’s revered La Florida bar. The version served there was both simple and sophisticated, but the drink’s reputation declined during the second half of the 20th century as bartenders dumbed the drink down into a fruity sugar bomb, completely burying the serene, dry original. The original presentation of El Presidente is a world apart from the familiar rum sour or tiki stylings of the Daiquiri, Old Cuban or Mai Tai. 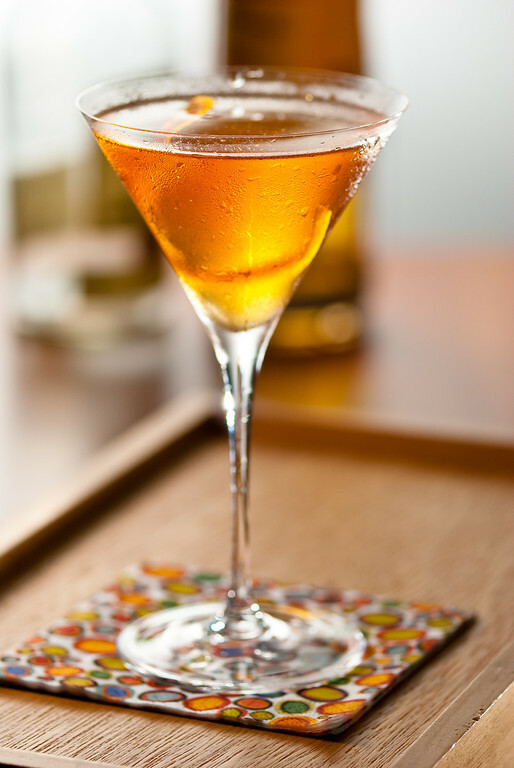 Rather than combine rum with lime, lemon or other tropical fruit juices, La Florida’s El Presidente followed the pattern established by the Martini and Manhattan, using rum, a large dollop of vermouth, and a dash of curaçao instead of bitters to enrich the mix. I prefer the curaçao; grenadine just doesn’t make it for me in this drink. Curaçao: Clement Creole Liqueur just became available in my market, so I was eager to try it in El Presidente. It works extremely well. Both Clement and Grand Marnier are fine choices for this recipe. And who is “El Presidente?” The assumption is that it was one of Cuba’s pre-Batista presidents (as opposed to some president of the Chamber of Commerce), and most bets are on Michado or Menocal. Or maybe it’s transferrable from one to the next? The La Florida Cocktail Book also includes a minty “President Menocal Special,” which suggests that El Presidente may predate Menocal. I doubt we’ll ever know the answer. “A return to Havana — The El Presidente Cocktail” at cold-glass.com : All text and photos © 2011 Douglas M. Ford. All rights reserved. I’m typically not a rum drinker, but El Presidente has appeal in name, as well as the combination of flavors offered up from the recipe. I’m curious if you have tried substituting bitters for the curaçao. Could be interesting. I’m going to add El Presidente to my list of cocktails to try. Simple and sophisticated sounds good to me. Interesting you should ask—I wondered the same thing, as I caught on to Martini/Manhattan as a model for El Presidente. Naturally, I did a couple experiments, and it turns out that a dash or two of orange bitters, either in place of, or in addition to, the curaçao, makes a pleasantly complex addition to the mix. Since bitters seem to appear nowhere in the drink’s history, I think you’d need to call it by some other name, but it does make a nice change of pace for El Presidente—and it gives you an option for pulling back the sweetness intrinsic to curaçao or grenadine. It doesn’t specifically spec orange bitters, but that’s your best bet. So now it’s time for more experiments. Generally make mine 2:1:1 or 4:1:1 both with a dash of grenadine. The equal parts of curacao and dry vermouth balance each other and the grenadine gives it a pleasing pink color (to some that is). I think my bias is based on how it is made here in Boston (also Paul Clarke used this ratio in an old Cocktail Chronicles post). Hi, Frederick— I’m guessing that my use of words like “dreck” and “undrinkable” probably isn’t going over well with Boston drinkers. It’s a good reminder (to me) that what’s sweet to one person is sour to another. (My sister reminds me of this every time I make her a whiskey sour.) I have to call ’em as I sees ’em, but my tastes change with the seasons to some extent; I’ll try El Presidente “Boston style” when cold weather rolls around, perhaps I’ll see it differently. The grenadine is an interesting ingredient in El Presidente. I can imagine bartenders swapping out curaçao for grenadine on a whim, depending on their tastes, and their customers. Using both seems like gilding the lily. It appears I just never gained a taste for grenadine. I despise the “cooked” style, though I’m still contemplating how to exploit that molassesy burned flavor into… something, as an intellectual challenge. The uncooked “cold” style is more palatable, but not a flavor I search out. And I guess that’s the story of how 2:1:hint with curaçao became my favorite El Presidente. Thank you for spelling out which Rums you’ve tried and what you recommend. FWIW our ‘go to’ white rum is Flor De Cana, if we want something that is not so ‘rummy’ we go to Myer’s Platinum. I’ve found that, as a generalization, Bacardi rums have too little flavor. I’m also pleased to see you spelling out your thinking on grenadines – so far we lean towards cold process grenadine – but our preliminary conclusion is no grenadine for this drink. Didn’t have Dolin Blanc the first time I made this, so I used Dolin Dry. BIG MISTAKE. The result was undrinkable and I poured it down the drain. Went out and picked up a bottle of Dolin Blanc, then gave it another go. Delicious! I used Flor de Caña 7yr rum, which is one of my favorites, otherwise used your recipe exactly. I had not learned of Morazán before, so I’m a bit better educated in my Central American history. Thanks for that. I’ve heard that El Presidente is pretty good with Flor de Cana, I look forward to giving it a try. I’m delighted that El Presidente barrel ages well. Aging is something I look forward to trying one day; I had always thought I’d start with a whiskey drink—Manhattan or Boulevardier, I guessed—but I may follow your lead and try El Presidente instead. Thanks for letting us know about your experiement. I’ve never made El Presidente with Barbados, but I think it would be worthwhile giving it a try. The drink seems to be originally a Cuban invention, which is probably why most people will suggest a Cuban or Cuban-style rum, in the theory that it would hew close to the original flavor profile of the drink, or at least as close as we can in these days. But I say, if you want to try it with a Bajan rum, give it a shot. And I will, too. Thanks! Perhaps sweeter than some would like it, but a very refreshing cocktail for a summer’s evening. Sounds good, I’ll try it. Thanks.